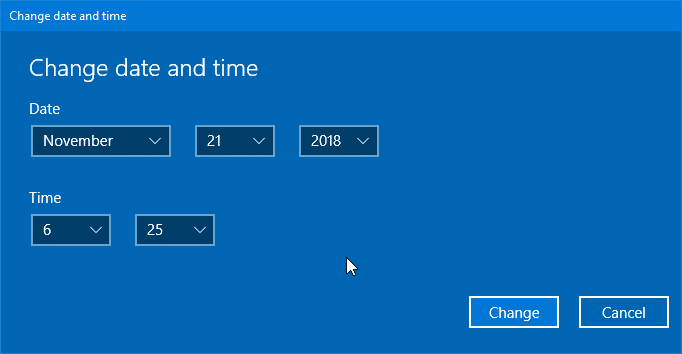 Windows 10 could display wrong date and time for a couple of reasons. It could be because of incorrect time zone, wrongly set date and time, or drained out CMOS battery. If Windows 10 is not showing the correct time, you can use the following solutions to address the issue. Following are the four troubleshooting methods to fix the incorrect date and time in Windows 10. Step 1: Navigate to Settings app > Time & language > Date & time page. Step 2: In the Time zone section, make sure that your time zone is selected. If not, please select the correct one from the drop-down box. If daylight saving time applies to your time zone, turn on Adjust for daylight saving time automatically option. 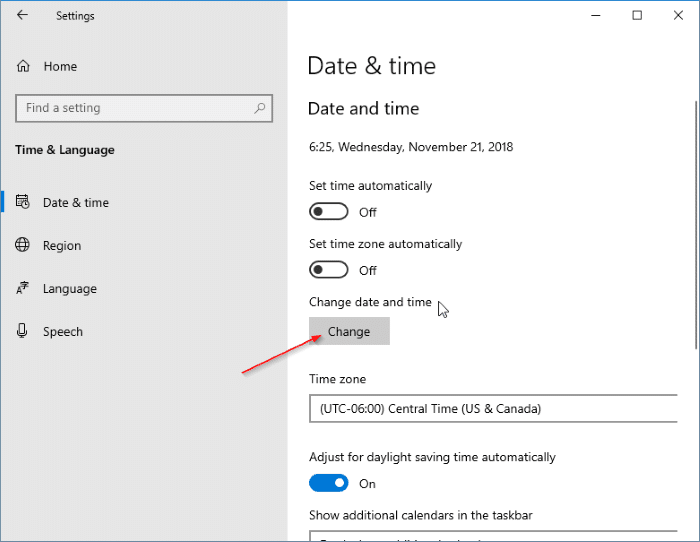 If your PC is currently connected to the internet, you can let Windows 10 set the time automatically. Here is how to do that. Step 1: Open the Settings app. Go to Time & language > Date & time page. Step 2: Turn off Set time automatically option if it’s already turned on. Turn on Set time automatically now. 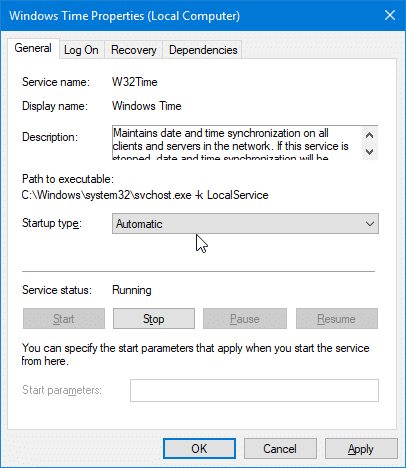 Windows 10 runs a background service called Windows Time which maintains date and time synchronization. Step 1: Type services.msc in Start/Run box and then hit the Enter key to open Services window. 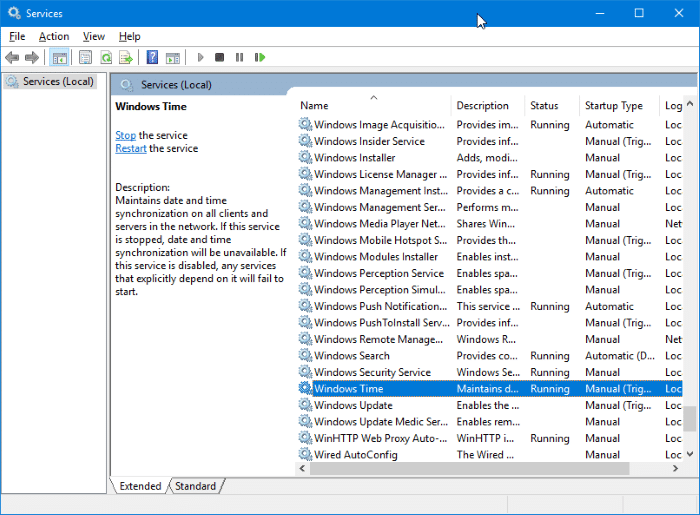 Step 2: Look for Windows Time service and then double-click on it to open its properties dialog. Step 3: Make sure that the startup type of the service is automatic and is running. If stopped, click on the Start button to run the same. Step 1: Visit Settings app > Time & language > Date & time page. Step 2: Turn off Set time automatically option. In the Change date and time section, click on the Change button. Step 3: Select the correct date and time. Click Change button to set the new date and time. CMOS battery is responsible for maintaining correct the date and time on your computer even when it’s turned off or plugged off. If the CMOS battery has drained out, your computer fails to maintain the correct date and time. Please contact your PC’s manufacturer to know how to replace the CMOS battery. Replacing the CMOS battery on a desktop computer is easy though and can be done yourself. I want to be able access my emails on my refurbished laptop which has windows 10. I see Yahoo no longer support windows 10 but you can use a browser . How and although I have found a download should I do it?